What can you do if you have an appointment at the mill at the very inconvenient time of 1.30 pm and, like every other Italian, absolutely don´t want to miss your pranzo (lunch)? You can only take a trip in a circle of 5 km around your house. 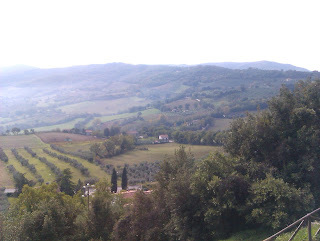 But, this is Umbria, so you don´t have to drive any further to have the most wonderful impressions. 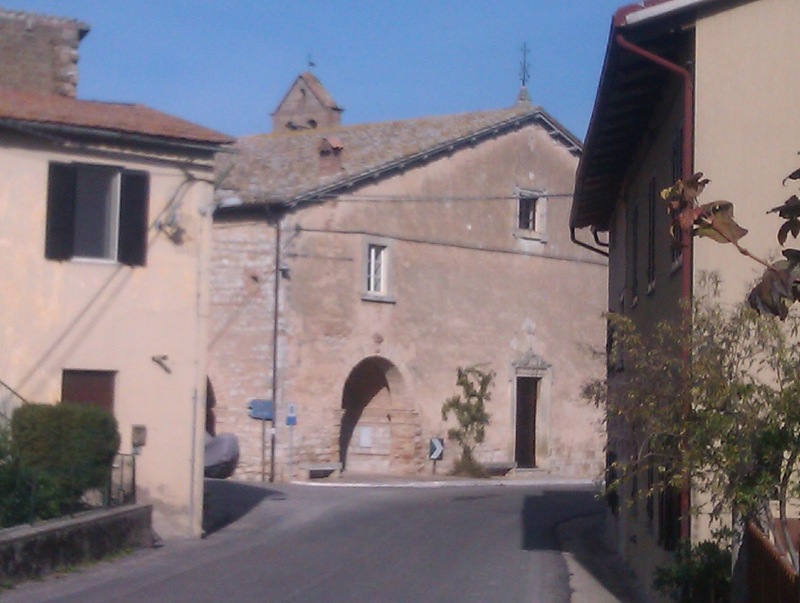 I left Viepri and went to Grutti, passing Castelvecchio on the way. 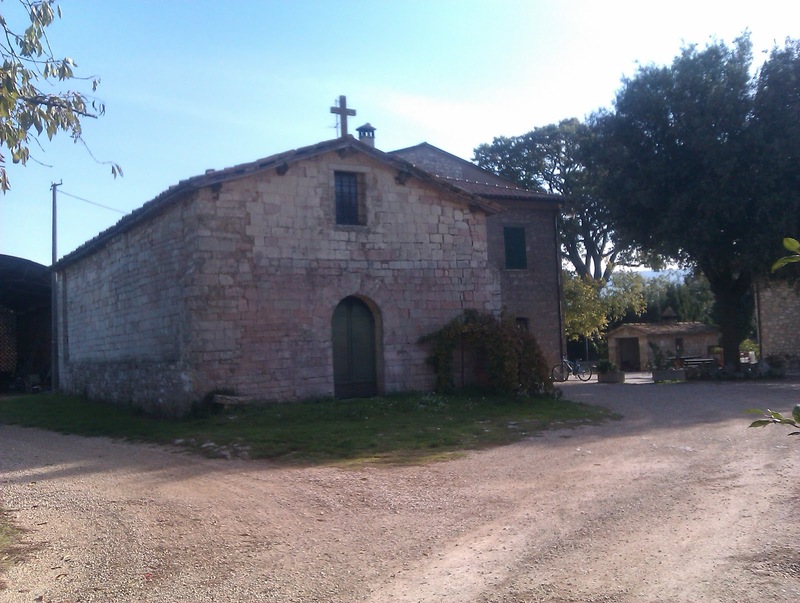 This is only a small hamlet with a few houses and a church and a bar. But exacly those two offered the typical view of an Umbrian village. To me they feel like little pearls, that, put all togehther, form the most beautiful necklace you can think of. It was worth the picture in fall, so imagine to have a cool drink on a hot summer afternoon in the shade of the trees, watching this small medieval church. Of course it was a quick job for it´s not too easy to leave your car at the middle of the road to take a picture. On the other hand, the very friendly Umbrian people never seem to care about such a thing and are most eager to tell you all about the history and everything else that has happened to them. Once they find out that you can understand their dialect a little – and I am beginning to – they are very proud of their lovely region. 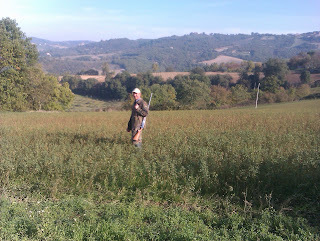 A few miles further, at Cacciano, I met a hunter with his two enthousiastic dogs. He allowed me to take a picture and told me he only hunted for hare, which is a task in the high corn being quick as they are. We had a pleasant conversation about hunting and I could only support his point of view: no killing for the sports, just to serve the purpose of a good meal and as I bonus I got a recipe. 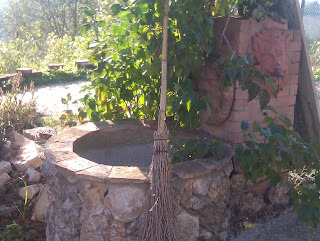 He told me that one of his dogs had been bitten by a viper but fortunately he had brought cortison that widens te veins. By lifting the dog and prevent it from walking, he saved its life and it had not done any harm, for the dog could hardly wait until our chat was over. Driving on I came as far a Montecastello di Vibio but I will save it for a separate post. It is way too lovely for just a few lines so I owe you. I had been away for only one hour and a half including my talk to the hunter, but I collected a few very precious pearls. Among other, formed by the stunning views on the way home. They just left me a single, but huge problem: I don´t want to leave this place.